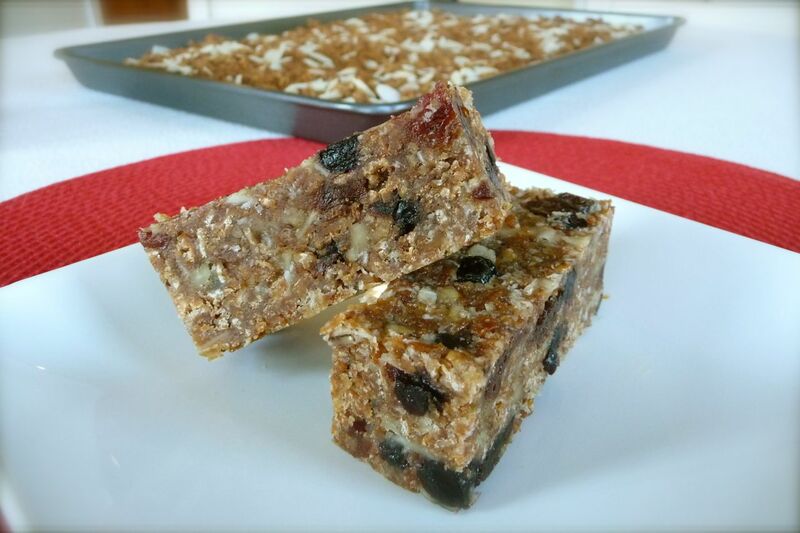 Homemade granola bars make a satisfying nourishing snack or lunch box treat. They’re also the perfect healthy goodie when it’s your turn to bring a snack to your kids’ school (or sporting) events. Below are three of our favorite homemade granola bar recipes. Each uses homemade soaked granola (a.k.a. The Best Soaked Granola) to create a delicious granola bar that’s chock full of protein and healthy nutrients – the perfect wholesome snack for busy families on the go! As shown above, another great thing about this recipe, is that its wholesome ingredients can be layered-up in a mason jar to create a beautiful and thoughtful “handmade with love” gift that can be given not only at Christmastime, but throughout the year as well! 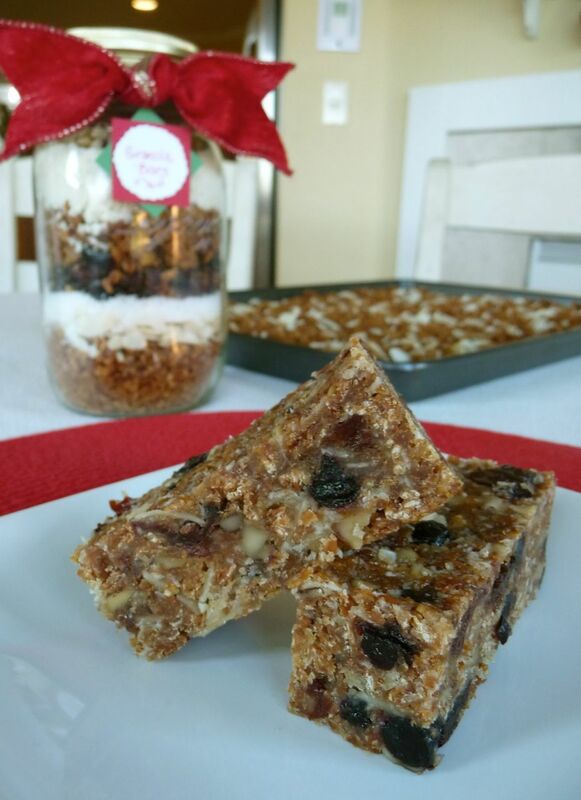 You can learn how to make my special Granola Bars-in-a-Jar gift at Keeper of the Home, recipe includes free printable baking instructions! Line an 8×8-inch baking dish with a sheet of parchment paper so that it overlaps on two sides only. Add the granola mixture to the parchment lined baking dish and even out with back of spoon. 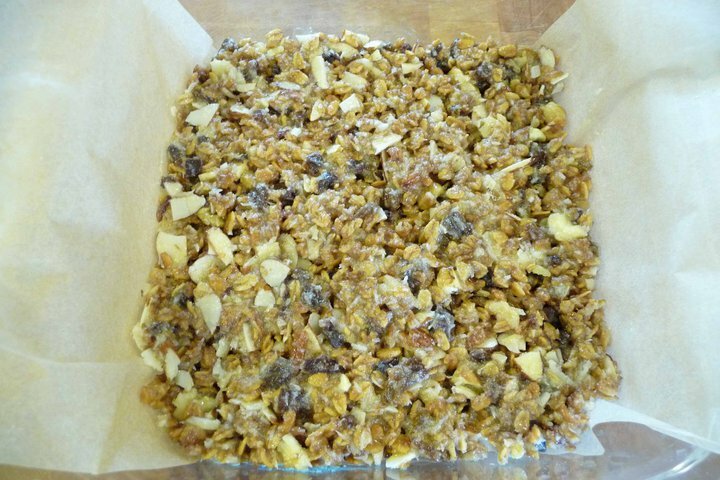 Then, fold the two pieces of parchment down on top of the granola mixture and press firmly into bottom of the dish (see photo below). 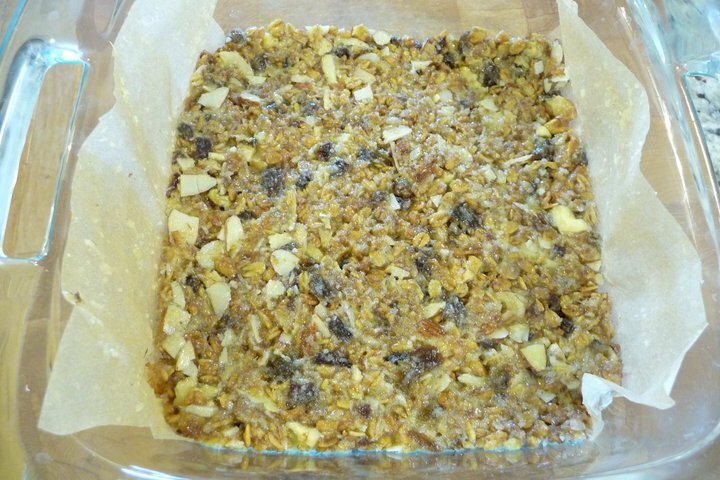 It’s important to press the granola firmly into the dish, so the bars hold together well and are not super crumbly. Unfold the parchment and trim excess paper. Bake 40 minutes. Remove from oven and cool on wire rack at least one hour and then transfer to the refrigerator for at least one hour. Preheat to oven 275 degrees. Line an 8x8-inch baking dish with a sheet of parchment paper so that it overlaps on two sides only. Or use a 5x9-inch loaf pan for thicker bars. In a medium bowl, combine granola, almond flour, coconut, nuts, chocolate chips and dried fruit. Mix well to combine. In a small bowl, whisk egg until slightly foamy. Heat a couple of inches of water in a small saucepan over medium heat. In a one-cup glass measuring cup, add butter, honey and milk. Place glass measuring cup in the warm water and whisk mixture together until smooth creamy. Remove from heat. Slowly pour warm honey mixture into bowl of beaten egg, while rapidly whisking to combine. Then, add the warm honey-egg mixture to the granola mixture, using a large spoon to mix together until all of the dry ingredients are well coated. Allow the mixture to sit about 8-10 minutes to so the granola has time to absorb the liquid. Then, add the granola mixture to the parchment-lined baking dish and spread evenly across the bottom of the dish, using back of spoon. Fold the two pieces of parchment down on top of the granola mixture and press firmly into bottom of the dish. It's very important to not skip this step (pressing the granola), as it helps to ensure that the bar will hold together well. Unfold the parchment and trim excess paper. Bake 40 minutes. Remove from oven and cool on wire rack at least one hour and then transfer to the refrigerator to finish cooling. 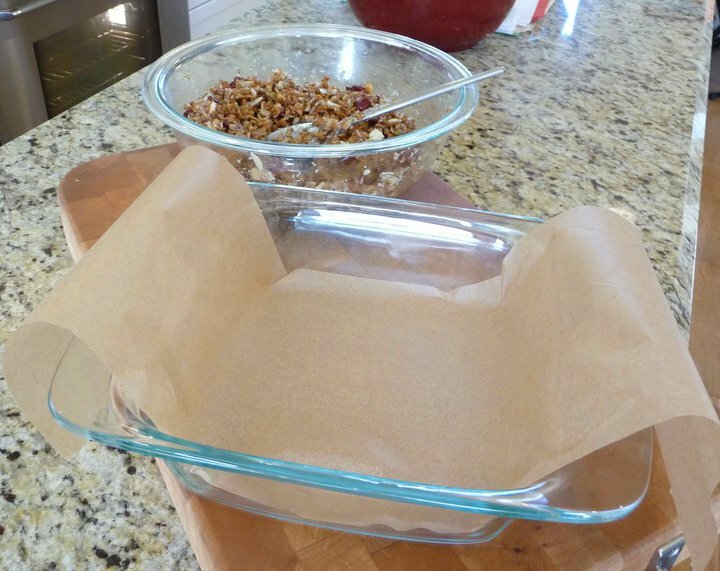 Once granola is completely cold, run a knife around the two edges of the baking dish that do not have parchment. 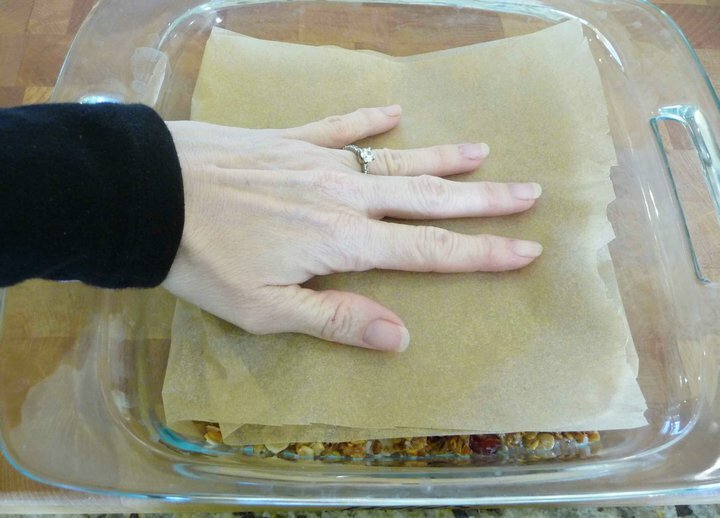 Holding the parchment paper edges, gently lift the granola flat out of the baking dish and place onto a large cutting board. Cut into squares, using a long, sharp knife. Wrap bars individually and store in frig or freezer. In a medium bowl, combine granola, almond flour, coconut, nuts, chocolate chips and dried fruit. Mix well to combine.In a one-cup glass measuring cup, add butter, honey and milk. Place glass measuring cup in the warm water and whisk mixture together until smooth creamy. Remove from heat. Slowly pour warmed honey mixture into bowl of beaten egg, while rapidly whisking to combine. Blessings to your new year. I enjoy your recipies. Have you ever made pizzelles with almond flour? I have been thinking of them quite a bit lately wondering how to make them. Use to make them with unbleached all purpose flour. Thanks for any tips for converting the flours. I tried the Best recipe and the Cherry Chocolate Chip. They are both very tasty, but we especially like the cherry chocolate chip. Quite Delicious and nutritious! Thanks for the great recipes. I used stored bought honey and I do find that it has a strong flavour. I’ll have to look for a milder honey or try a different sweetener. Still a keeper that I will definitely make again. Just tried the cherry chocolate again, but used brown rice syrup this time. The flavour is nice (much milder than the honey), but they didn’t stick together as well. Maybe I didn’t press the granola into the pan enough or maybe the syrup added too much moisture. Still delicious! Just wondering how long these will last outside of fridge/freezer storage. We are going on a trip overseas and I would live to have then as snacks between meals, etc, but not sure how they will last. Thx! Love, love, love your website, recipes, and all the other fabulous stuff. Thx soooo much! Do you think coconut flour (much more economical) could be substituted for the almond flour? Or maybe some maca powder? Any ideas what the nutritional data is on the baked granola before the add ins? Calories, protein, fiber etc? Can I substitute the honey for agave or dates? Have you tried either? We are Vegan and many of your recipes sound delicious! I recently made the soaked oat granola and it turned out fabulous! 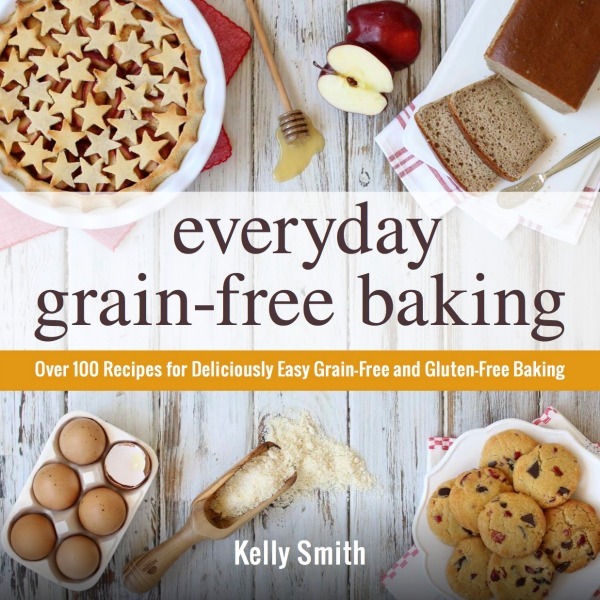 I just want to be sure I understand the granola bar recipe. The granola needs to be completely done, totally baked, and then you use it in this recipe, is that correct? On another point, wouldn’t it be more nutritious to include the almond flour in the soak, when you’re making the granola, because then it too would have had, you know, all those good things happen to it. But maybe that doesn’t work for the making the granola into bars, I don’t know. The almond flour I buy hasn’t been previously soaked. Hi, Gigi. Glad to hear you’re enjoying the soaked granola. Yes, you are correct the recipe for the granola bars is based on using the already cooked (finished) granola. So it’s not really possible to soak the almond flour since it comes after the fact and is mainly used to help bind the bars together. General consensus is that it’s not critical to soak blanched almond flour. That’s because the heaviest concentration of phytic acid is found in the skin of the almond. So with blanched almond flour, there is no need to soak, because the skins have been removed. Of course a bigger issue is the enzyme inhibitors and tannins found in the skin of the almond, which can cause significant digestive issues, yet another reason why blanched almond flour is the better option. And of course, there is also the issue of oxalates in almonds, which for some can cause much trouble, especially if one’s diet is high oxalate overall. With that said, my personal opinion and recommendation is, if you are especially sensitive to phytic acid (and/or have health issues linked to poor gut health), then I would strongly advise healing your gut first through a diet such as GAPS and then proceed as this program suggests in slowly adding a wider variety of whole foods back into your diet as you progress in healing your GI tract. We dont use almond flour due to a nut (ALLLLLLL nuts) allergy. What would you think would be the best swap for the almond flour? I am almost ready to try some recipe in Tiffiny’s new book. As I was reading it, there are some recipe bars that call for peanuts. Could there be alternative nuts to use, if one is allergic specifically to peanuts, cashews and pistachios? I have made the homemade granola and granola bars many times now, and the only thing my girls would better would be if the granola bars were less moist. Is there anything we could do for that? Ever made them with coconut flour instead of almond flour?